I don’t remember learning much about money as a kid. But I remember having it, because my dad started me working around the house and at his office building at around 10-11 years old. He paid me pretty well, and I spent it pretty well. Well, for a little while I did; when I decided I wanted to go to the prestigious, all-boys, private, Catholic high school — the one with a $2,000+ annual tuition — that’s when I learned to save money. The child has a list of jobs to do each week. Rather than “giving an allowance”, you’re paying the child for the work done. Just like real life, if you don’t work, you don’t get paid. If the child doesn’t do a certain job, does it poorly, or does something else s/he’s not allowed to do, the child gets “fined” and receives less money at the end of the week. The money earned gets divided into three categories: GIVE, SAVE, and SPEND. We’ve decided that our kids have to put 20% of their salary in the GIVE envelope, and 40% each in the SAVE and SPEND envelopes. 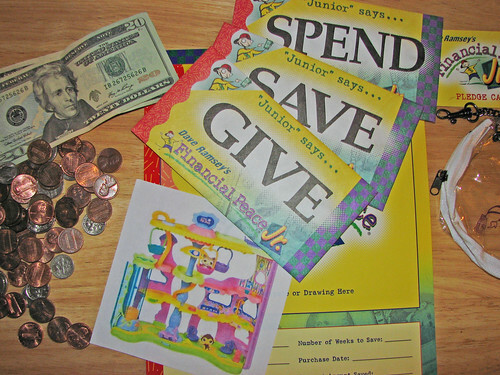 The child can use the SPEND money, and some of the SAVE money, to purchase a desired item or experience. There’s a chart where s/he lists what the item is, how much it costs, how much s/he’ll put away each week toward the purchase, and how long it should take to have enough money. I think this’ll be good. I’m hoping they learn financial discipline; the value of work; that money isn’t just for spending; that giving to the less fortunate is important; and that good money management has rewards. The kids are excited. I think that’s half the battle right there. Any chance you could send a big fat SAVE envelope to Congress? I’d really appreciate it. K Thx.